The basic concept of karma posits that the good things and bad things in the world must be equal; and so for every positive thing, a negative must follow. If this is true, then there are some things that simply should not happen. Not because they are inherently bad, but rather because they are so good that they must yield some sort of karmic disturbance. Let me give you an example. The Sigma Tau Delta "Reawakening" Convention this year in New Orleans set the stage for some of these scale tipping events: New Orleans, English, and a break from the cold weather of New Jersey. Before I arrived in NOLA, I was stressing intensely about presenting my paper. Reading your work only brings up everything you remembered disliking about it, and then finding new things to hate. For example: this thesis is too vague, this evidence is not explained enough, this theory is misapplied, these sentences all start with "according to...," etc., etc., etc. This anxiety, of course, was added to the fact that I had the first slot for presentations. 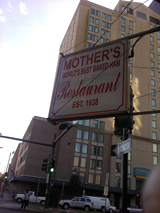 We arrived, and I eased my racing heart by clogging it, with perhaps the most delicious sandwich I had eaten until that point in my life—The Famous Ferdi from Mother's. Seriously, look it up and ask yourself why you didn't get it while you had the chance. It is the pinnacle of culinary perfection—the ultimate good. In any case, I spent most of the night sweating and fearing the questions that would stump me and make me look like a fool the next morning, which came much too quickly for my liking. I presented my paper. I stood behind the podium, I read and inflected, pronounced all the Spanish words correctly, then sat down. Then the questions came. They were not easy, but they certainly were not hard. I suddenly realized that I was the expert of my own paper, that no one else there knew as much as I did about what I had written, the rhetorical and logical devices I discovered and applied to the literature. The reality dawned on me, that I was surrounded by people who respected each other, what they had written, and whose questions were meant not to puncture, but to probe. Panels are a reciprocal learning experience, and I learned this the instant I answered my first question. It truly was incredible. Like I said, there are things that are too good to leave karma equal, so logically I came down with a terrible cold as soon as I returned home. The cosmic scales came back into balance with snot filled tissues. Yet, I would gladly eat saltines and drink ginger ale—yes, I would even give up po' boys--for another week if it meant that I could experience this year's convention again.